Sarah Sawyer, MD consults with a patient. Looking forward to living longer is one of the great things about life in the age of modern medicine. However, most of us probably hope to look younger longer too. Fortunately, as life-saving advances in medical science have progressed, so too has cosmetic dermatology. "The whole field of cosmetic dermatology has made tremendous progress in recent years," Sarah Sawyer, MD, of Dermatology and Laser of Alabama, said. "The primary difference is downtime. We can do so much now without patients having to take time away from their routine. Between the range of fillers we have now and new lasers that can help to smooth and firm sagging skin, we can often avoid or postpone the need for a deep chemical peel or a face-lift so patients don't have to fit days of recovery time into a busy schedule." Unlike the collagen fillers of a generation ago, today's line fillers don't require allergy testing days in advance. "The most popular fillers we use to erase fine lines are made with hyaluronic acid, which is a naturally occurring substance found in the body. Patients can see results immediately. They can return to work the same day," Sawyer said. How long the lines stay away depend on the type of filler chosen and the individual. "Good health and skin care habits, staying out of the sun, and avoiding inflammation seem to help," Sawyer said. 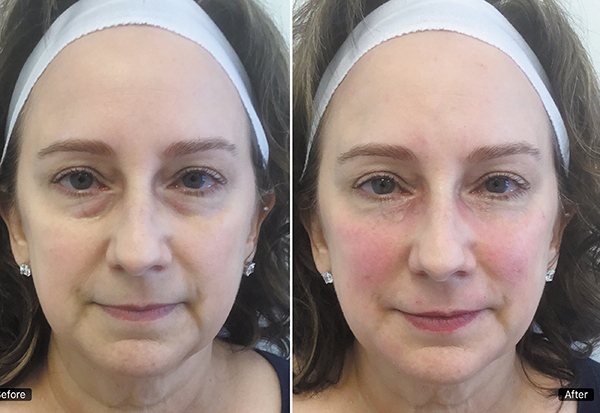 "The fillers we use for lighter lines don't last quite as long as those for deeper lines, but we often suggest starting with the lighter fillers the first time so we can evaluate results and fine tune any adjustments when using longer-lasting fillers." Longer-lasting fillers tend to cost a bit more per syringe, but also offer more time between touch ups. An evaluation, care plan and estimate are provided before treatment. A patient before and after filler under the eye. "We often recommend a combination of modalities to achieve optimal results," Sawyer said. "With our new lasers and other firming techniques, we can tighten sagging skin to achieve many of the benefits of a face lift without the need for an incision. The laser stimulates the lower layers of skin, which begin to gradually tighten over the next several days. We usually do two sessions for faces and two to four sessions for larger areas with more sagging. When the firming is complete, the results can be amazing." The firming capabilities of Lasers are particularly effective in combating the early signs of aging as the skin becomes lax and begins to sag along the jaw line. This tends to occur at an age when careers can be very competitive. Although we like to think ageism isn't a problem in the workplace, looking more energetic can boost confidence when you are working toward a promotion. "There are also new options in addition to botox to take on the difficult vertical lines on the forehead between the eyes," Sawyer said. "Another area that can contribute to a more youthful look is under the eye. Sometimes the problem isn't so much a baggy lower lid as it is loss of fat under the eye that makes the lid look more prominent. Injecting a little filler in the right location can make quite a difference." The skin tightening capabilities of new lasers can also help with some of the subtle signs of aging such as loose skin beneath the arms. They can also be use to contour some of the hard-to-tone areas around the torso and lower back. In addition to reversing signs of aging, Sawyer helps her patients deal with other skin problems. "We're always on the watch for skin cancers and changes in the skin that could be heading in that direction. My associate, Scarlette Smith, MD, works primarily in medical dermatology and I focus on cosmetic dermatology, but there is some crossover. For some patients with rosacea, we're seeing good results from laser treatment. We also help patients smooth scars left by acne and injuries," Sawyer said. With tattoos more accepted than in the past, there are fewer requests for tattoo removal, but lasers are still used to help with tattoos that are fading, losing definition, or needing a bit of preparation for editing when relationships memorialized on the skin don't last quite as long as tattoos. Looking to the future, Sawyer expects to see even more dramatic improvements in cosmetic dermatology. "With so much exciting research into stem cells, biotechnology and at the genomic and cellular level, looking younger longer is likely to be getting easier in the years ahead"